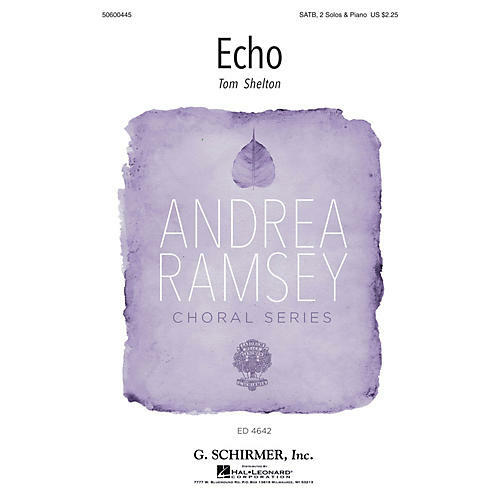 G. Schirmer Echo (Andrea Ramsey Choral Series) SATB Chorus and Solo composed by Tom Shelton Jr. Commissioned for the 2016 Eastern Division ACDA, this Christina Rossetti poem is a wonderful teaching piece. The melodic line in the opening section is constructed to evoke feelings of beauty, loss and remembrance. A middle section paints a picture of grief, reality, and the feeling of life spinning out of control. After the climax of this middle section, there is a return to a sense of calm, symbolizing that as time passes, we are able to come to terms with loss.